The Daily Telegraph published this "Death Cult" front page. The newspaper front page we can't quite believe is real. 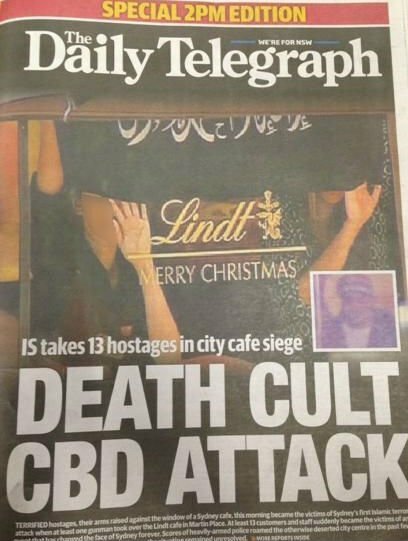 The Daily Telegraph has printed a special 2pm edition covering the horrifying siege underway at the Lindt Chocolat Cafe at Sydney’s Martin Place. 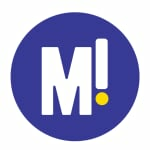 The edition was rushed out this morning, and it’s already drawing concerns from readers and commentators. The coverage does not heed any of the multiple warnings from police and law enforcement for media agencies to be careful and measured in their reporting and not to incise fear, hatred or violence amongst the community. The front page also reports that 13 hostages are being held in the shop, which was what we widely understood to be the case earlier today. However subsequent reports suggest the number may be as high as 50. There’s also the matter of the hostages’ identities. There are a lot of things Australia needs today: peace, security, authorities calmly doing their jobs, and responsible decisions by those in positions of power are among them. Scare-mongering — as well as finger-pointing, hyperbole and speculation — are not. Our thoughts remain with the hostages and their families. Read Mamamia’s rolling coveraget of the Martin Place siege here. Read our wish for the frightened hostages trapped inside the Lindt store here.